Its an O'Neills, so guess what its crowded, noisy and expensive...Its an O'Neills.
" Chat to girls in the que, offer to pay there entry (�6) get there names before you get to the bouncers, and tell them you are a group together. Works every time. Get knocked? Chances are you will get knocked from everywhere in London"
Seriously what planet are you on!? Offer to pay their entry fee plus your own so you can go and drink a pint of Guinness in a pub? And "Get Knocked - Chances are you will get knocked from everywhere in London". You talk utter rubbish my friend. I've never been "knocked" from any other bar/pub in Central - and thankfully I didnt even "get knocked" from here as I had the sense to avoid it and not pay the entrance fee! Of course any bar or club has the legal right to turn anyone away that they think might genuinely cause trouble of some sort. But its so unusual to be turned away with no explanation, that its really an inexcusable insult. I've now seen this happen at this place, for absolutely no reason whatsoever. I saw one couple turned away, they looked well dressed and nice people. Completely humiliated without reason in front of an entire queue of people. I've seen it myself to many others also almost completely arbitrarily from what I can see. I was behind one group and they were just treated terribly, they were happy, well dressed, ready to have fun night and spend some money, just ruined afterward. So it really seems to be up to luck whether you will get in or not. So your decision to go there is dependent on whether you are willing to risk having your whole night ruined by this kind of treatment. Why is this happening then? The only explanation I can come to is that the door staff are INCENTIVISED to turn people away. Randomly if necessary. Why would they do that? I've no idea, certainly doesn't make business sense. But maybe they are trying to set up some sort of exclusive feel to the place? 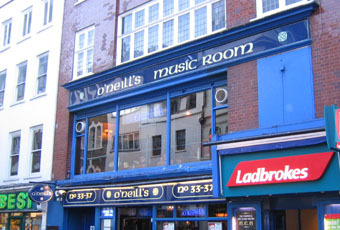 And its really very far from that -its the classic O'Niells, stale poisonous beers, with the small advantage of a band playing. The whole thing has a taste of very bad spirited Management. Lucky enough to be given the opportunity to manage a bar of this size in Central London, but unqualified in terms of basic human values, and respect for others. You can't fail to make an enormous profit in this location. They do lose business during the week though, thats undeniable. I'm not going again for a long time. Avoid like the plague. Though that shouldn�t be too hard, seeing as my experience seems to reflect a lot of the problems faced by others who have made comments. Approaching the entrance on a quiet Monday evening, the bouncer stopped me, asked me if I was alone. I told him I was meeting some friends inside, but I wasn�t sure if they were they yet as they had told me they were running late. �I�m not letting you in unless you know for sure you have people inside� was the response I got. I explained that I�d probably have to check, but he was having none of it. Seemingly realising that his reasoning was on very shaky grounds, he then decided to ask me for ID, which as a 30-year-old and looking clearly older than either 18 or 21, I no longer carry. �Not letting you in, you don�t have ID.� At which point, I told him this was ridiculous and stormed off. I then went back, as this was absolute nonsense the way I was being treated, especially seeing as the pub looked to be fairly quiet. He refused to answer any more of my questions, failed to give me a valid reason why I had been denied entry, and so I feel compelled to let others know. I was dressed in my office work clothes, wasn�t rude and can see no real reason why this ought to happen. Don�t waste your time. In response to the last poster dee1ite. I went there last weekend as saw hardly a single black person in the entire place. No one. Which is obviously a really unusual thing. But it is an indication of the kind of atmosphere and weirdness of the place, which is undeniable. But if I were you, if I were treated like that, or denied access a single time I would never give them my custom again.